Things that could have happened, but did not. Different pathways history could have taken, some unlikely, some of them probably more likely than the actual reality that unfolded. 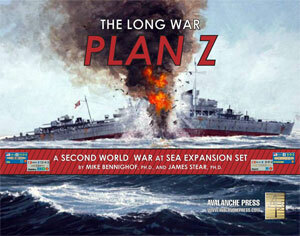 Alternative history is the basis of several of our game lines at Avalanche Press. As our world enters an age of alternative facts, we’ll be right here with games into which you’ll want to escape. In late 1916, American President Woodrow Wilson offered to mediate an end to the ongoing First World War. The warring powers flirted with his proposal, but ultimately rejected the overture and war continued for another two destructive and murderous years. Our Second Great War setting explores what might have happened had Wilson succeeded. The old empires – Germany, Austria, Ottoman Turkey, Russia - have survived into a new generation. France, Italy and Russia seek to overturn the new status quo, while the Central Powers try to defend their economic gains. With the Great War ending in 1916, heavier-than-air aircraft have had less of a chance to prove themselves, with lighter-than-air appearing to be the craft of the future. The navies of 1940 rely on airships and helicopters far more than their handful of short-ranged biplane aircraft. The battleship is the arbiter of naval power, and the Second Great War at Sea is a battleship war. Players love battleships, and we have crafted a setting to allow their maximum use. The story of the Second Great War is told in our background book, titled The Second Great War. The actual Second World War unfolded in the same manner as Ernest Hemingway described bankruptcy in The Sun Also Rises: “gradually, then suddenly.” Our Long War setting studies how the conflict might have unfolded with a slower start, with Germany allying with Poland and attacking the Soviet Union in 1940, and overrunning France two years later. Those extra years allow Germany and Britain to construct much larger and more powerful fleets than they fielded in the historical conflict; when war comes, it is a hotly-contested naval war. Where The Second Great War leans heavily in the direction of dieselpunk, The Long War envisions a world of advanced science, with the warships and aircraft that either arrived too late to see major action in the real war, or were never completed (or in some cases, even begun) take to the seas and air: jet aircraft, primitive missiles, giant aircraft carriers.